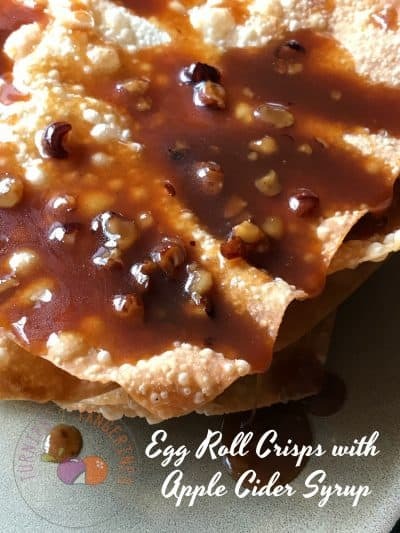 Egg Roll Crisps with Apple Cider Syrup is the first of five recipes that I have entered in the Twin Dragon Asian Wrapper Blogger Recipe Challenge! JSL Foods sent Egg Roll Wrappers, Won Ton Wrappers, and Gyoza Wrappers (Potstickers) to inspire me and 75 other food bloggers to create Asian or Asian fusion influenced wrapper recipes. Twin Dragon Asian Wrappers are a blank canvas waiting for my innovation and cravable creations! Two of the five recipes that I will be entering in the contest are inspire by the flavors of Autumn. Apple cider, brown sugar, cinnamon, and sweet potatoes are just a few of the ingredients I used to create easy and delicious recipes. This will be a week long celebration of recipes, dedicated to Twin Dragon Asian Wrappers. The first recipe we will be sharing is a dessert recipe, based on recipes that can be found in many ethnic cultures. You will find some form or another of this recipe in almost all ethnic cultures. In Norway they have Fried Norwegian Cookies or Fattigmandbakkeles, in Poland they have Polish Fried Cookies or Chrusciki, and in Spain it’s Churros. 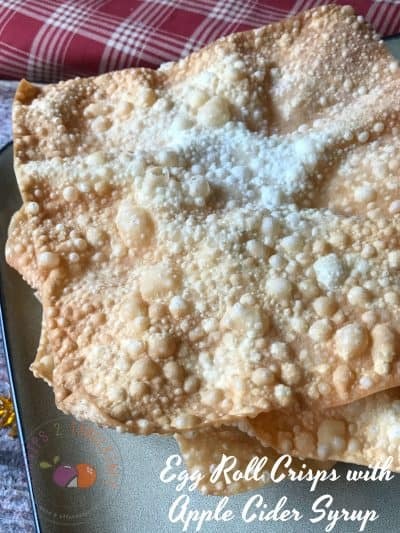 I’m positive that this list goes on and on, after all anything fried in hot oil and dusted with cinnamon sugar or powdered sugar is going to taste good! Am I right or Am I wrong…as my grandma would have said. This recipe is made using JSL Twin Dragon Wrappers. JSL is a third generation, family owned business located in Los Angeles. JSL Foods has built a reputation for innovative market leadership since 1951. Today, they are a leading manufacturer and marketer of Asian Noodles and Wrappers, Long Goods Pasta and Baked Goods. Follow JSL on all of their social media outlets. For each serving stack em’ up! 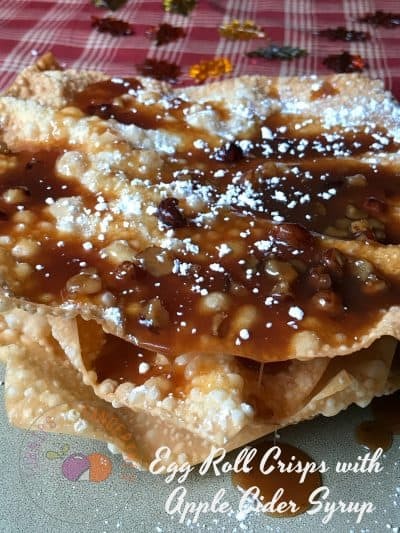 For each serving place one egg roll crisp on a plate, sprinkle with cinnamon sugar mixture, then drizzle with apple cider syrup. 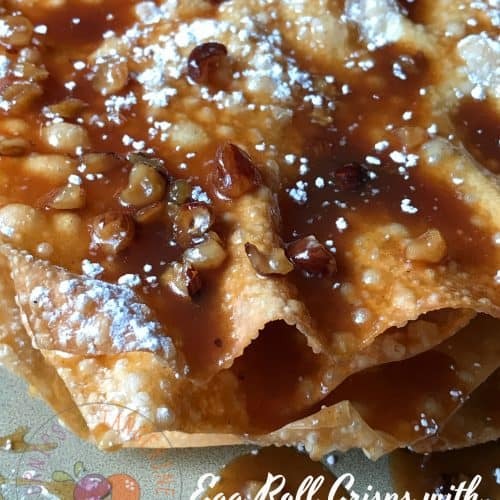 Place another egg roll crisp on top, sprinkle with additional cinnamon sugar and drizzle with some more apple cider syrup. 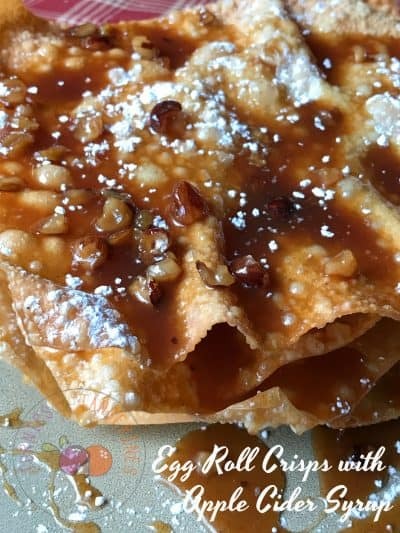 To finish place another egg roll crisp on top, drizzle with more syrup, a shake of powdered sugar and your good to go or in this case, your good to serve and enjoy. 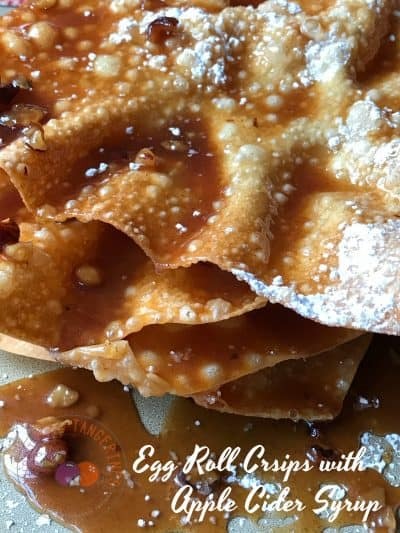 A sweet and delicious way to serve egg roll wrappers. Heat oil in large saucepan to 375 degrees. Stir together sugar and ground cinnamon, set aside. Set aside powdered sugar. Meanwhile make sauce. In medium saucepan, combine sugar, cornstarch and cinnamon; stir in apple cider and lemon juice. Cook until mixture boils and thickens, stirring constantly. Remove from heat; stir in butter and hazelnuts. Set aside. Fry whole egg roll wrappers, one at a time, in hot oil. Fry about 1 minute per side or until golden brown, carefully turning over with slotted spoon. Drain on paper towels. Sprinkle warm fried egg roll wrappers with cinnamon sugar mixture. Drizzle with warm apple cider syrup and sprinkle with powdered sugar. Serve. Blueberry Goat Cheese and Mint Rangoon is another recipe using Twin Dragon Asian Wrappers. Give them both a try! Looking for more Egg Roll Wrapper recipes?? Here are a few that will make you smile:) Shrimp Egg Rolls with Sweet-Sour Sauce, Pork Egg Rolls with Orange Sauce and Pineapple Pork Spring Rolls.